Many breech presentations result in cesarean deliveries to prevent dystocia. Dystocia is defined by Merriam-Webster Dictionary as slow or difficult labor or delivery. Williams Obstetrics outlines three distinct reasons for dystocia. The three physiological/ biomechanical causes for dystocia as defined by Williams Obstetrics are as follows: 1. Abnormalities of the expulsive forces (Power) 2. 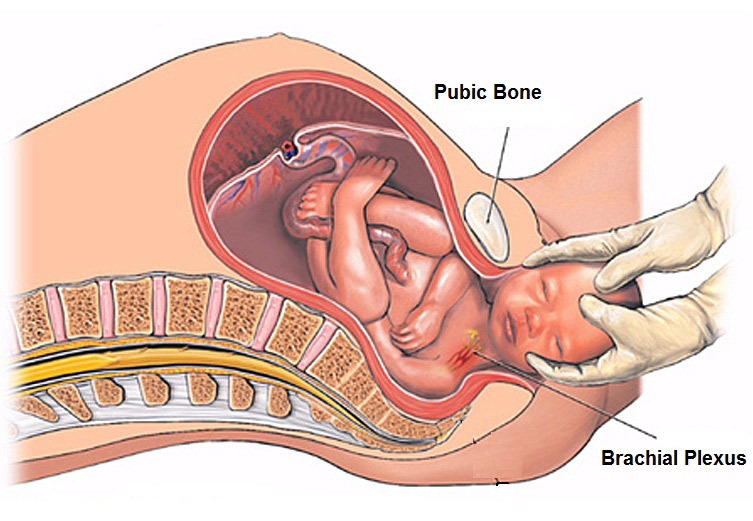 Abnormalities of the maternal bony pelvis (Passage) 3. Abnormalities of presentation, position, or development of the fetus (Passenger). Let’s take a closer look at each one of these individually, and my goal is to help explain how chiropractic can help with each one of these facets of dystocia. The first reason for dystocia as defined by Williams Obstetrics is abnormalities of the expulsive forces (Power) which can be further dissected – Uterine forces can be too weak or inappropriately coordinated to efface and dilate the cervix (this can also be defined as uterine dysfunction) or there may be inadequate voluntary muscle effort during the second stage of labor. This first reason for dystocia is a functional condition which chiropractic may improve. The uterus is a muscle, and every muscle needs a nerve supply to be able to contract and function in harmony with the body. If there is not adequate nerve supply to a muscle, it could potentially not fire at all or it could fire out of sequence. Correction of sacral subluxation may positively effect this causes of difficult labor by removing uterine nerve interference, keeping the pelvis in proper alignment, and reducing tightening and torsion of specific pelvic muscles and ligaments. The second reason for dystocia, as defined by Williams Obstetrics, is the abnormalities of the the maternal bony pelvis, also defined as pelvic contraction (Passage). Williams Obstetrics states that “any contraction of the pelvic diameters that diminish the capacity of the pelvis can create dystocia (difficulty) during labor.” They also make note that the diameter of the woman’s pelvis is decreased when the sacrum is displaced. With Webster’s technique, the sacrum misalignment which causes the pelvic misalignment/ distortion is corrected, thereby reducing the pelvic contraction. The third reason for dystocia, defined by Williams Obstetrics, includes the abnormalities of presentation, position, or development of the fetus (Passenger). A sacral subluxation/ misalignment can result in an imbalance in the muscles and torsion in the ligaments leading to uneven pulling of the uterus and restricted fetal space for movement. It is proposed that as the sacrum rotates; the utero-sacral ligament and opposite round ligament becomes taught which in turn puts additional tension on the uterus. In the female patient the efficacy of the Webster Technique sacral adjustment is supported by doing a light effleurage trigger point therapy on the corresponding taught round ligament. Trigger point therapy is well supported by the medical literature, and there has been peer reviewed research showing a correlation between correcting sacral subluxations with Webster Technique and proper fetal positioning from breech to vertex. If you have more questions about this, please contact our office for more information.